Sweet cherries (Prunus avium) and sour cherries (Prunus cerasus) are the two main types grown. The sweet varieties are more popular and may be eaten raw, preserved as jams, canned and bottled. The sour cherries have more intense flavours and are better suited for baking in pies. 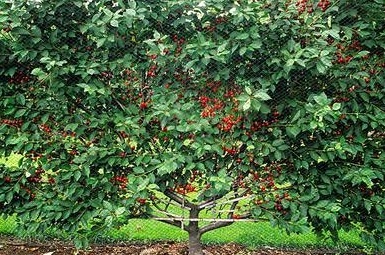 The sweet cherries grow large, up to 8m high and 6m wide, although dwarfing rootstocks are available to make patio trees. Sour cherry trees are smaller and better suited to small gardens. They have different growth habits but require the same conditions. A chilling requirement of 800-1200 hrs below 7oC is needed. Sour cherries are much smaller and bushier than sweet and most cultivars are self fertile. Fruit is borne on one year old shoots grown the previous summer. ‘Morello’ is perhaps the best known cultivar. Sweet cherries fruit on spurs two years or older and need a compatible pollinator. Cherries need an open, sheltered, sunny site with deep, well drained soil. Plant bare rooted trees in winter, bagged trees at any time. Fan training is popular, so the supports must be in place before planting. Fruit thinning is unnecessary. Watch crop performance and leaf discolouration which may indicate nutrient deficiencies and apply manures and fertilisers as necessary. Give them the care normally applied to other fruit trees. The most common pests are birds, pear and cherry slugs, aphids and brown rot. 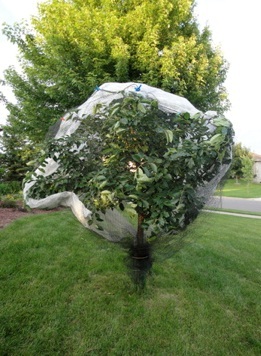 Protect from birds with netting and pick the fruit as soon as it ripens. Harvest by cutting the stalks to avoid infection, rather than pulling by hand. Prune mature sweet cherries in summer to slow vegetative growth and encourage fruit bud formation. Decide on the shape of the tree, whether vase, central leader or fan. Leave three or four laterals in the first year and prune back to two thirds or a half. In the second year, prune back the sub laterals to two thirds or a half and remove other weak or narrow angled laterals. Sour cherries are pruned in spring and summer to provide a constant supply of new fruit producing wood.